Elizabeth Goudge’s Eliot Family Trilogy? Then, it is Elizabeth Goudge. I find Goudge in a category of her own. She is spiritual, at times mystical, fantastical (Faerie, but just in cameo appearances), romantic in the sense of the woods being infused with symbolism, almost medieval. But her characters deal with modern problems that most authors of her genre would avoid. One man falls in love (inexcusably, I’d say: one must recognize boundaries) with the wife of one of his relatives. This complex relationship is the focus of her first book, but isn’t completely resolved until the third. Goudge’s parents have favorite children. Some of the marriages lack love. One character’s violent past is haunting. There is a strong sense of place. Damerosehay, a large eighteenth century house purchased by the Grandmother, home base for the Eliot family, is the focus of book one. The Herb of Grace—a Pilgrim’s Inn, where sojourners stay on pilgrimage to a sacred place—is more ancient, with deep history in its walls. 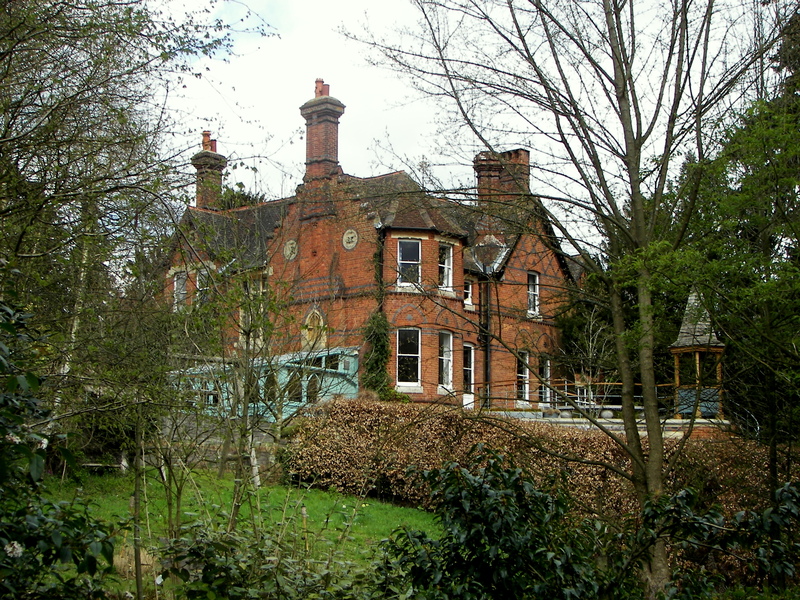 George and Nadine’s restoration of this Inn is the focus of the second book. The third book adds Lavender Cottage, a small place where Margaret and Lucilla can retire. Her themes resonate with me: determined contentedness; work as a sacramental offering; the mystery of small joys; beauty indoors and outdoors, interior and exterior; the inscrutable connection between twins; aging, grandparenting, and above all else, relinquishment. Hilary, wounded in the first world war, is stable, sensible, lovable. Hendrickson has recently reissued the trilogy. a Rafflecopter giveaway Congratulations, Di! 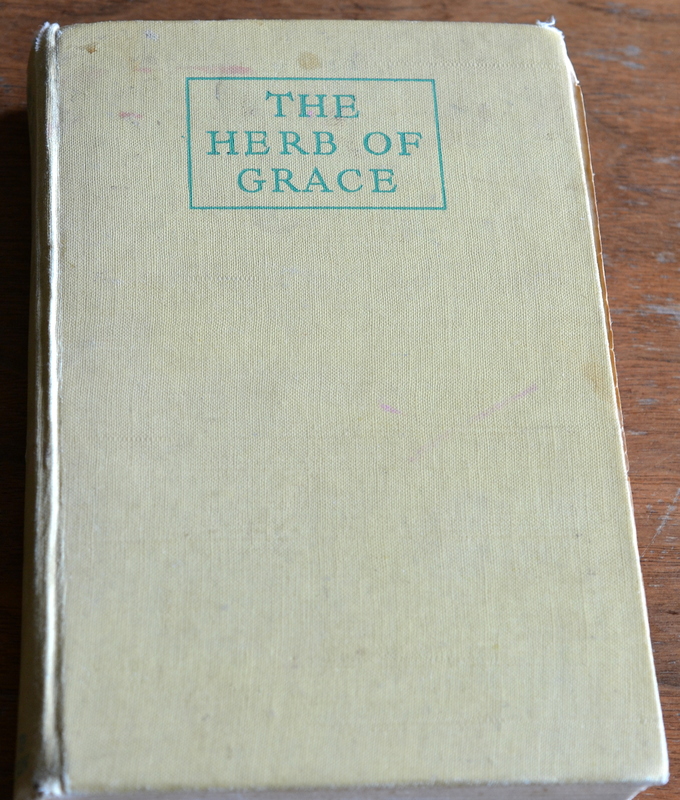 You won the Herb of Grace book. *It occurred to me that my definition of ‘treasure’ might not jive with yours. Here is a picture of the book. It is not a pretty book, but I love the inscription in the front “Jeanette Pound 1950” and I like old hardbacks. This entry was posted in book review, Books, Quotes and tagged beauty, eliot, elizabeth goudge, england, quotes, relinquish, work by alivingpencil. Bookmark the permalink. I tried to enter your giveaway, but I’m not sure it worked. I’ve read some books by Goudge, and for me, she’s hit or miss. Some things I’ve read are very, very good, and others I tried but couldn’t get into. I like English fiction because I’m fond of jolly England, an Anglophile at heart. There are two entries there. I don’t know why the widget doesn’t seem to be showing. Probably because I’m using the free edition! I just checked and your entry didn’t show up, Sherry. Try again? I’m hoping to re-read this trilogy in 2014. I read Green Dolphin Street last year, and it is at the top of my favorite books of all time list. You have so accurately captured Goudge’s gift – place, people with real issues, grace, forgiveness, among others. I love many things about English fiction, but I think I like the descriptions of landscapes best, with charming butlers (like Sayers’ Bunter) coming in at a close second. I too have tried to enter your giveaway but am not sure my effort “took.” I had never heard of Elizabeth Goudge until I started reading some booky blogs. She is a real gift. So far, I’ve read three, and I leave enough time between to savor what has gone before. I don’t agree that your copy is not a pretty book. It looks exactly the way it should and brings back happy memories of used bookshop browsing and purchasing. I can only check every six hours, Juliette, but I’ll look to see if you are entered. I should have just done this in-house, but Raffecopter seemed more professional. Yikes! Carol, any word on whether I actually entered or not? Juliette, your entry went through. I apologize for the difficulties. Ooh, a raffle! I’ve only read two by Goudge — The Little White Horse, and Green Dolphin Street. Loved them both. I got Gentian Hill from a library sale, but haven’t started it yet. I’m glad you entered, Kelly! I too am a huge fan of Elizabeth Goudge, and love her books! No need to enter me–I have them all, much re-read! Thanks for stopping by, Charlotte. I love Elizabeth Goudge, although some books more than others.I first heard of her from a Mennonite Pastor’s wife! She appeals to a surprising range of readers. She had some profound insights on suffering in a number of her books. That is interesting! Ruth Bell Graham calls Goudge her favorite author on the back cover of Book 3 of the trilogy. Oh, I forgot to add what I love about English fiction. I have found that my favorite well-written books are often English and often published before 1950. Did England produce so many wonderful writers because their school system was “Classical” and immersed students in good literature? Or (I’ve wondered) was it that same immersion combined with a Christian foundation and that wonderful British routine and discipline? Have you read Trollope? I really enjoy his Barsetshire books. I like reading English fiction because it’s the next best thing to bring there! 🙂 Thank you for the giveaway opportunity, Carol. A gift of a book treasure found in England has to rank up there with best kind of gift ever! I’m glad your entry was received, Sherry! Thanks for the suggestion! I’m adding these to my list of books to find. You really haven’t lived until you’ve read her children’s books; The Little White Horse and Linnets and Valerians. I LOVED Linnets and Valerians but be sure you find the unabridged version of it! Several wonderful pieces of rich dialogue were cut out of the abridged version (because the words were too hard to understand, apparently). Also, I Saw Three Ships is a short little Christmas book that is sweet but not life-changing. I have had a note on my to-read list since you posted this, saying “Elizabeth Goudge” — and my roommate just gave me an old copy of Green Dolphin Street! It’s lovely, especially after the anticipation. I’m so glad! And it was ever so nice of you to let me know. Thanks!